Author Annie Barrows (co-author of The Guernsey Literary and Potato Peel Pie Society) once again evokes the charm and eccentricity of a small town filled with extraordinary characters. 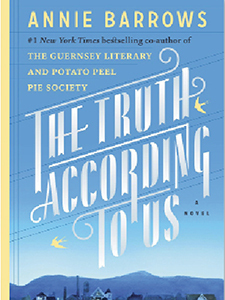 Her new novel, The Truth According to Us, brings to life an inquisitive young girl, her beloved aunt, and the alluring visitor who changes the course of their destiny forever. In the summer of 1938, Layla Beck’s father, a United States senator, cuts off her allowance and demands that she find employment on the Federal Writers’ Project, a New Deal jobs program. Within days, Layla finds herself far from her accustomed social whirl, assigned to cover the history of the remote mill town of Macedonia, West Virginia, and destined, in her opinion, to go completely mad with boredom. But once she secures a room in the home of the unconventional Romeyn family, she is drawn into their complex world and soon discovers that the truth of the town is entangled in the thorny past of the Romeyn dynasty. At the Romeyn house, 12-year-old Willa is desperate to learn everything in her quest to acquire her favorite virtues of ferocity and devotion—a search that leads her into a thicket of mysteries, including the questionable business that occupies her charismatic father and the reason her adored aunt Jottie remains unmarried. Layla’s arrival strikes a match to the family veneer, bringing to light buried secrets that will tell a new tale about the Romeyns. As Willa peels back the layers of her family’s past, and Layla delves deeper into town legend, everyone involved is transformed—and their personal histories completely rewritten. The Truth According to Us ($28 from The Dial Press) is available June 9.